I have neglected my crafting for 3 weeks while we planned and started the Pond Adventure! It is not done, we need to tweak it a bit and landscape around it. All the creativity of the rocks is my son's idea and he wanted me to not look until he was done placing the rocks. We have mountain spirals and spikes in the area that he wanted to mimic so this is what he came up with. First we spray painted the area where he is digging from the waterfall down to the pond. We chose to be up by the front entrance of the house as there were overgrown shrubs there and they looked awful. The bottom photo are the pond layers. The next thing is to add the pond underlayment and the lining. Lucky for me my husband and Isaac were in town that weekend so they could help Noah lay it out and add the river rock to form the bottom of the waterfall and pond. Here they are working hard figuring how the rocks should go. 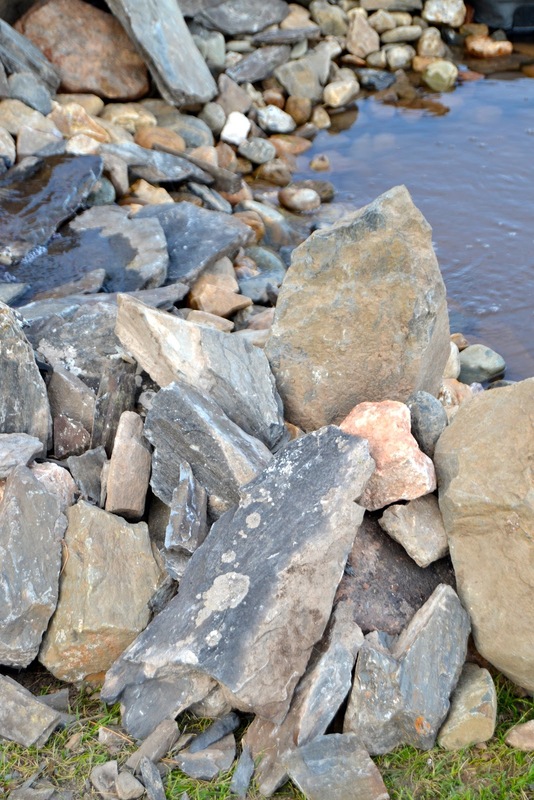 After they left, Noah and I headed for the mountains and picked some shale. My truck doesn't look full but this stuff is so heavy the truck was lowered pretty good and then we had to drive mountain roads all the way back, up and down, up and down 3 trips. 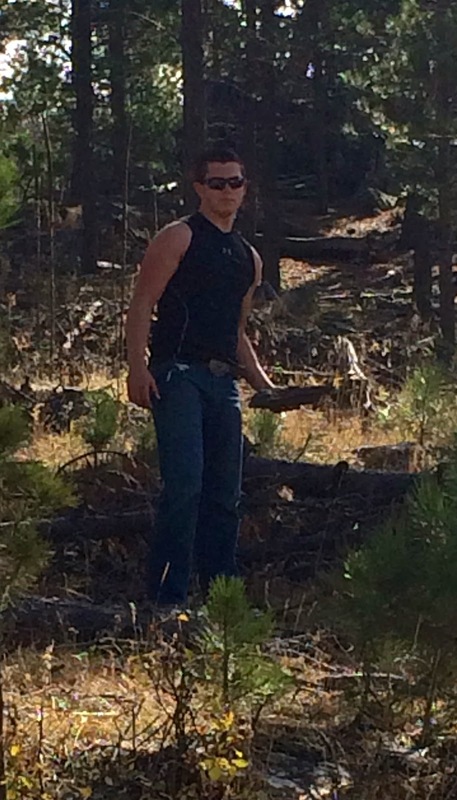 My son Noah, not quite 15 years old, 6 foot 1 and full of muscles already, that would be the farm food we raised him on. He is finding flat shale in the woods. Here is Noah at the water fall laying down the flat shale. 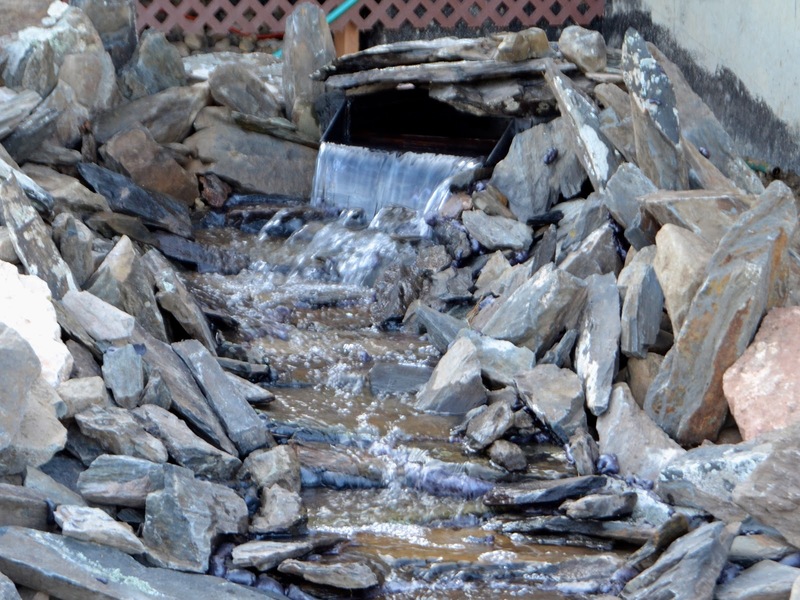 The waterfall is coming along and you can see how he is laying the shale pieces over the river rock. Some of them need to be foamed in to keep them water tight. Here is the waterfall and pond with water in it, I know the angle is funky. He is still setting pieces. We need to go back and get more rock and build it all up around the whole area and then landscape it. In the Spring we will try out some fish in it. Here is some of the outside stack of jagged edges. Noah took 2 weeks off and went to MN with his dad to hang out with the guys so the pond progress is on a break. I can hear the water in my craft room as my window is right above the waterfall. Very pretty and soothing. I made a few cards this past few days, just thought I would throw them on here too. Thank you for stopping by and I hope you enjoyed our pond, this was a very fun thing for us to do as well as my son feels pretty good about himself right now. Accomplishments. Your pond is looking wonderful Kelly… what an amazing job you've all done! 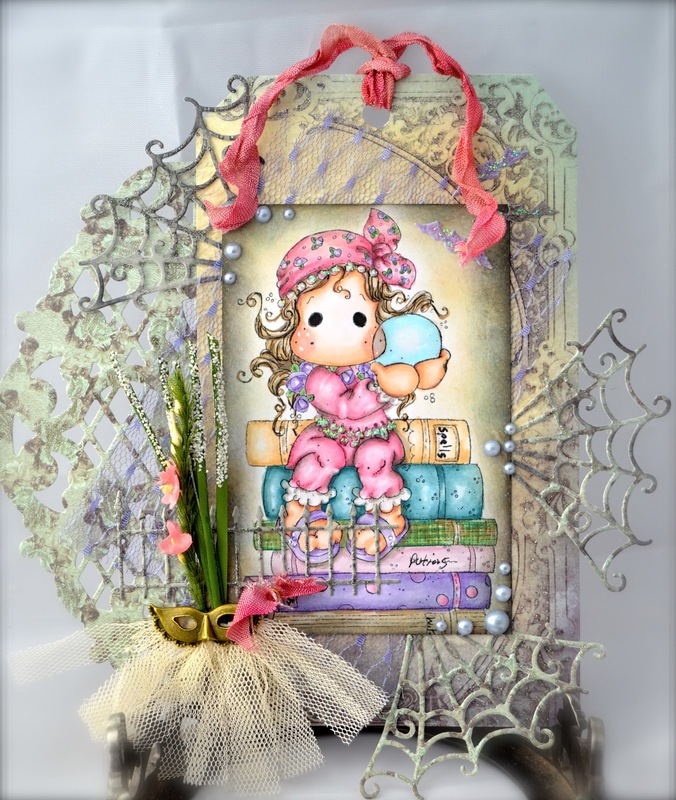 Love your cards… the first one is SO pretty… such a cute Gypsy Tilda and you've coloured her to perfection! Cute cards Kelly - your sons are working hard! OH! la la... I followed your pond adventure Kelly, this is huge... it would be the size of my backyard... remember I live in the city! it is lovely, I bet you could put some gold fishes in there! Your Tilda tag is gorgeous. I love love love this image so much. love all the pretty elements you surrounded her with. gorgeous colors, so very precious. Hugs. You will get so much enjoyment from the waterfall and pond. They are so nice once you get a few fish and a few plants in it! Two beautiful cards, both very different, but both stunning! I'll gladly sit in your craftroom and listen to the waterfall or on your patio or in your yard right beside it. It looks INcREDibLE!! :) Your two cards you made recently have it all and look stunning Kelly! The pond is looking fabulous Kelly, you have all worked so hard but you have been rewarded with something that will look stunning when it is finished - Noah is certainly a handy young man to have around the house - and he certainly deserves a break! Fabulous pond Kelly and everyone did a great job. Love the cards.. that Hallowe'en one makes me laugh, such a fun image and I really like those feathers! Love seeing the progression of this waterfall....absolutely fabulous, Kelly!!!!! It will be so gorgeous once you have it landscaped....such a beautiful addition to your new home!!! I adore your cards as well. Wishing you a beautiful day!